Megan Harley designed a gadget to help people with bipolar disorder as the final year project for her Product Design degree. A device designed by Middlesex University Product Design graduate Megan Harley for her final year degree project is currently on display at the Design Museum, after being shortlisted for the AXA PPP Health Tech and You exhibition. Megan was inspired to create the product by a family member who is bipolar, and after conducting market research developed a wristband called 'Aware' which users wear at night to monitor and manage their sleep patterns. For those living with the condition, sleep patterns are highly significant as sleep acts as a prominent bio-marker in people with bipolar disorder. Before a relapse some have not slept for days. The wristband wirelessly syncs to an app, which then makes users aware of any patterns that may indicate an imminent relapse or 'crisis', helping them to self-manage the condition. The app can also be set up to inform family members, friends, a psychiatrist or others in their support network. "It's such an amazing opportunity to have my work displayed in the Design Museum so early on in my career," said Megan. "I feel really privileged to have been selected by industry experts from among more than 120 products developed by professional companies. "I've been contacted by people around the world asking when it will be available, so hopefully having it showcased in somewhere as prestigious as the Design Museum will be a stepping stone to making it available. 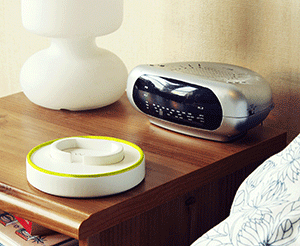 To create the device, Megan evolved current fitness technology designed to measure sleep to help sufferers of bipolar, which is said to affect one in every 100 adults at some point in their lives. The innovative product was selected as part of a global showcase to recognise the organisations, designers and clinicians who are developing new digital approaches to managing healthcare. Aware could also be potentially used to gather information for research into the condition, and Megan is hoping to discuss its potential with mental health charities and the NHS in the near future. "We're very proud of Megan's achievement," said Wyn Griffiths, Product Design Course Leader at Middlesex. "Aware was her final year project and it brought together new technology and sensitive insight into bipolar support opportunities. "Megan is a fantastic designer and representative of the course; open-minded, empathetic and with the creative and design craft skills to manifest meaningful design propositions." Visit Megan Harley's website to find out more about Aware and her other projects. 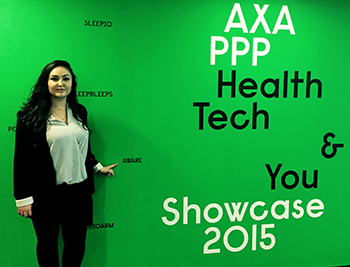 The AXA PPP Health Tech & You website could be useful for anyone looking to find out more about the organisation.